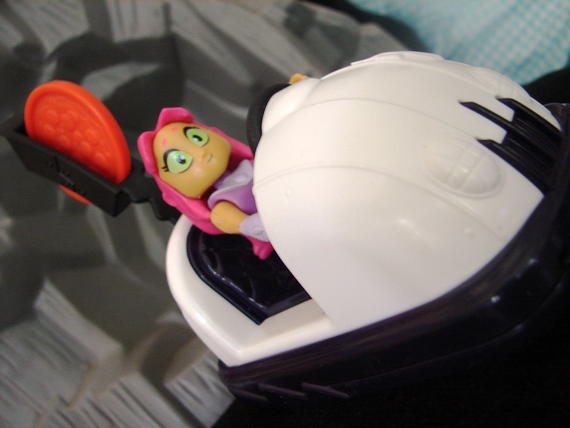 Last week I reviewed the Imaginext Teen Titans GO! Raven, and today we look at Starfire! 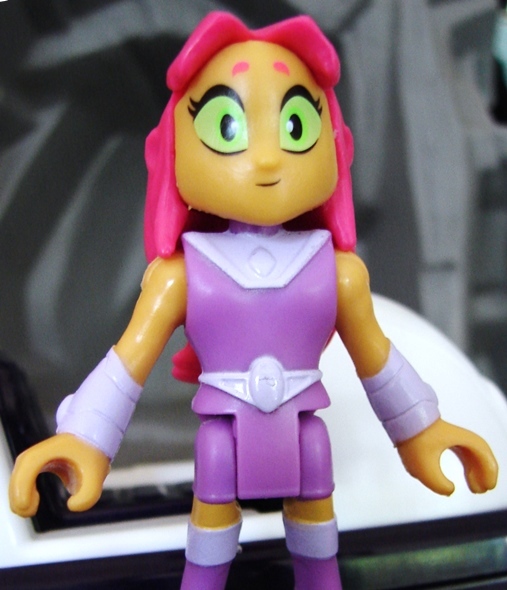 Starfire is a single figure set, one of the basic releases and retails for $7.99 (at Toys R Us). These new Imaginext Teen titans GO! sets are being spotted at Toys R Us and K-Mart as of press time. They should be showing up everywhere Imaginext are sold any day now. 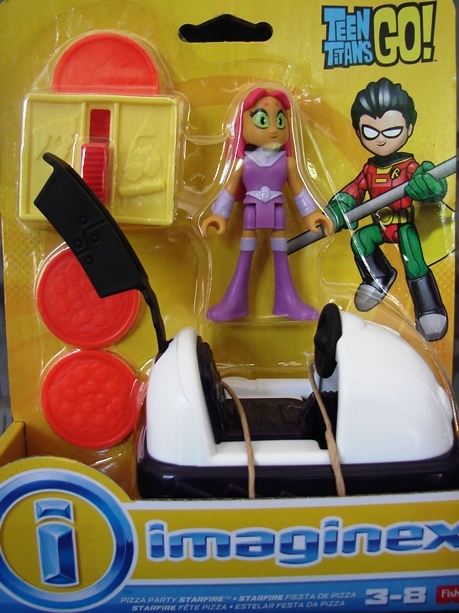 Starfire comes with a pizza flinging bumper car. I may have missed the episode wherein a pizza flinging bumper car is a thing, or maybe it isn't a thing and they just threw in a pizza flinging bumper car because reasons, but either way I'm ok with it. If nothing else, I can pawn the bumper car off on Harley Quinn or the Joker as it is within their interests. Starfire also comes with a pizza launchign pizza box. 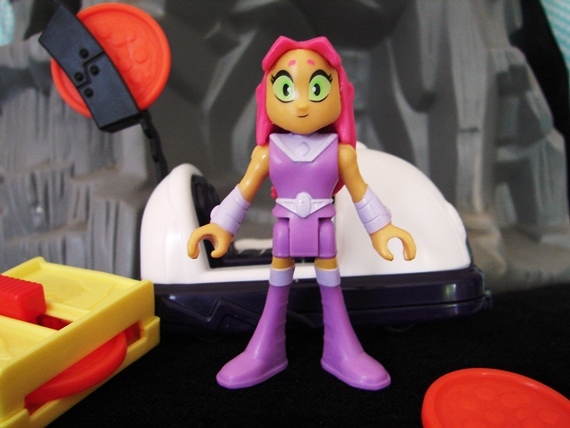 It doesn't connect to anything nor is there any way for Starfire or any other figure to hold it. 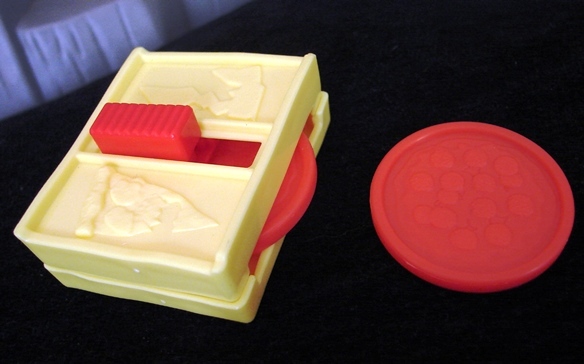 But hey, pizza launcher. Good times. Starfire is more off-model from the toon than Raven. Her head just isn't large enough. I also take issue with her ears being part of her hair-piece (and therefore not flesh colored.) That said, I'm glad Fisher-Price released Starfire (and Raven) right off the line. It says a lot for how far toy manufacturers have come and for who the Imaginext toyline is aimed at. Ye olde 'girl action figures don't sell' mantra of past decades may finally have lost it's delusional steam. Ain't no party like a crazy pizza party 'cuz a crazy pizza party got anchovies, son! 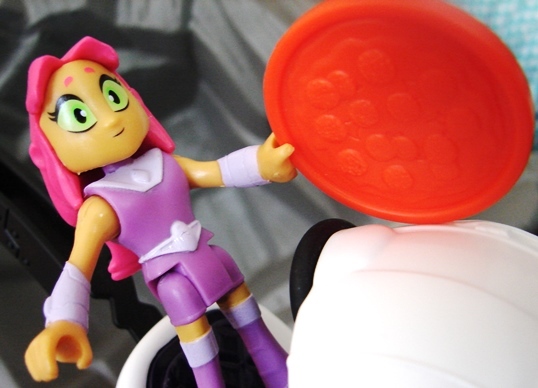 Starfire comes with three pizza disks, so your kids will lose them all in about 30 minutes or less. The Teen Titans GO! cartoon is hilarious and absurd. 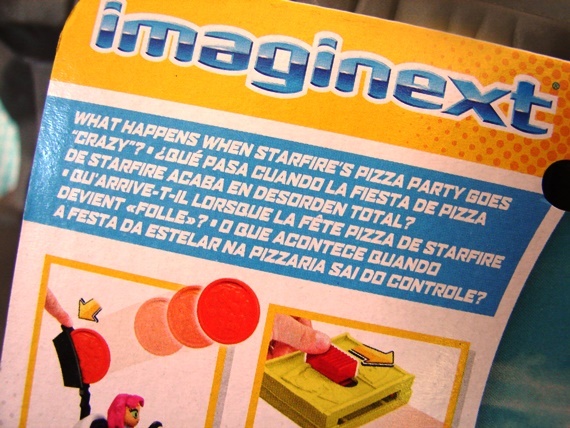 I'm hoping to see many Imaginext variants based on ridiculous cartoon storylines and moments. I also hope we get a lot of villains and additional heroes too (Aqualad, Speedy, Kid Flash etc.) In the meantime, it's nice that rounding out the four primary team members won't require you to buy massive and/or exclusive playsets or jump through other ridiculous hoops to accomplish. Labels: action figure, Fisher-Price, Imaginext, Starfire, Teen Titans, Teen Titans GO! More Imaginext Teen Titans! Very cool.